Focus: Female police officers and agents. Length: 8-16 hours over 2-days. Almost all firearms training is male-based. The male rangemaster tells you what to do and how to do, and then you do it...over and over again. Then you've got it, right? Well, this works well for male learning styles, but it does not address the realities of how women are hard-wired to learn. Being shown or told how to do something and then being expected to "rep it out" and "get" the lesson simply does not address the female's need for learning. A woman learns differently than a man--not better or worse, just different. CUTTING EDGE TRAINING pioneered training female officers to effectively employ combatives successfully based on a woman's intrinsic and inherent learning style. This combatives handgun and tactics program brings to the professional female peace officer the first real training designed to make the female officer successful in any street situation. This system of combatives maximizes your innate attributes so that you can be as safe and effective as you can possibly be if suddenly faced with a deadly force response. Rather than some watered down seminar, this is an intensive training program that dramatically and effectively increases the ability to win a gunfight. Developed from the street "in," NOT from the range "out." These live-fire combatives seminars are about solving your real-world tactical shooting needs when you cannot afford to be second best. Your world is not a competition. Instead, you live and work in the most real world there is: where hitting another person with bullets means you get to go home to your family today. It is about REAL-WORLD tactics that have been proven over decades and throughout history to keep you alive during those violent, sudden, vicious, and short-lived police firefights. “Handgun Combatives for the Female Officer” provides advanced, comprehensive training for handgun employment at a level appropriate for any female officer (patrol, Narcotics, detective, etc.). This is an "evidence-based system," proven on the street, that is measureable, observeable, and repeatable. It has continued to revolutionize and evolve over the last 30 years. These courses cover the laws and articulation of deadly force per the Constitution and your state law--knowing exactly when you can fire gives you enormous freedom of action. Included in the classroom portion is fire discipline theory, movement and fire, the proper use of barricades, and Live Fire Combatives. Each seminar is a fast paced, content-packed eight-hours of enough classroom time to understand the concepts, and more than enough shooting and hitting to incorporate the lessons into your "toolbox"--all geared to the female shooter. These are a “must attend” program for any female officer preparing to utilize justifiable force combined with absolutely proven methods of employment and safety. 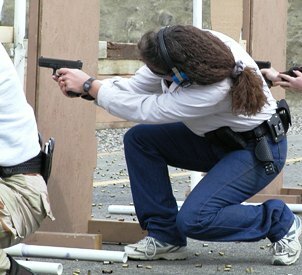 This unique handgun training seminar provides every female officer in every assignment the ability to put hits "on-target, on-time" in a combat environment based on your own learning style. We concentrate on real-life gunfights--up close, very personal, violent, short-lived, life-and-death conflicts. All live-fire is predicated upon moving and hitting the suspect, not simply shooting. We teach you, probably for the first time, how NOT to shoot your partner in a dynamic situation where there are multiple officers on-scene. Live-fire exercises where you and your partners engage in physical combatives, safely performed, effectively and realistically prepares you to engage a deadly threat at contact ranges--this is the beginning of truly learning to fight with your handgun...all based upon CUTTING EDGE TRAINING's "Effective Combatives Problem-Solving"© concepts. And finally, how to articulate your deadly force response should the worst happen and you are forced to injure or kill an offender. This comprehensive course will change the way you fight with a handgun.